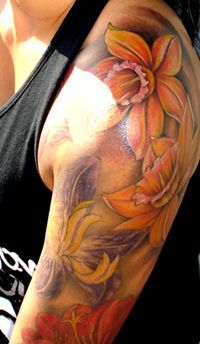 Realistic daffodil tat of four blooms done in orange and pink and one in purple that wrap around as an upper sleeve. Flower tattoos can be drawn with a pop art look or realistic like a photo. These daffodils have lots of colors and shading to make them look real. There are three that are done in pink, orange, white, and yellow and another done in purple and white. This girl put a black shaded background behind the blooms to make them stand out. Having the flower petals overlap here and there create a nice pattern that you could extend into a full sleeve or onto the back later. If the black background is too dark for you, a white or light purple backdrop would also have the same effect against the colors of the flowers.